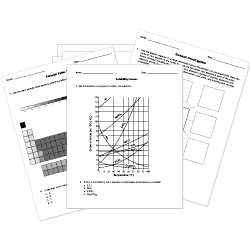 You can create printable tests and worksheets from these Grade 7 Bonds and Mixing questions! Select one or more questions using the checkboxes above each question. Then click the add selected questions to a test button before moving to another page. have a definite chemical composition. The solubility of most solids in water can be increased by . Mixtures may be solids, liquids, gases, or any combination of them. If substances are combined and no reaction takes place, this is called a mixture. A very well mixed mixture is a . A mixture in which the substances are not mixed evenly is called . Two or more substances that are mixed together, but do not chemically combine, form a(n) . A mixture that is made up of two or more parts that is visible to the eye is called a(n) . single, double, or triple bond. Jonny is mixing a solution in science class. He is told to mix sugar and oil. What will Jonny most likely conclude about his solution? The force that holds two atoms together is a(n) . Two or more substances that are mixed together, but not chemically combined, make a(n) . What is the major difference between concentration and solubility? Concentration is measured in grams of solute per 100 mL of solution and solubility is measured in grams of solute per 100 mL of solvent. Concentration is measured in grams of solute per 100 mL of solvent and solubility is measured in grams of solute per 100 mL of solution. Concentration is measured in liters of solute per 100 g of solvent and solubility is measured in liters of solute per 100 g of solution. There is no difference. Concentration and solubility is measuring the same variables. Mrs. Readings orange juice solution contains 25% pure orange juice, 70% water, and 5% sugar. What is the solute(s) in this solution? A salad would be considered which type of mixture? A concentrated solution of tea and water has a small mass of dissolved solute for a certain quantity of solvent. Which one is not an example of filtration? Solubility can be determined by creating unsaturated solutions.